I put together a page on my PBP bike, a Rivendell Bleriot with 650b wheels. The wheels are larger than 650c but not as big as 700c. They allow the use of fatter tires without having to deal with huge wheels. I couldn’t have had such a good ride at PBP this year without my Rivendell Bleriot 650b-wheeled bike, so I thought a page was in order to detail the bike and my setup. I had no mechanicals on this ride in wet, rainy conditions. The shifting got a little slow when the chain needed lube, but nothing else. If you’ve read Bicycle Quarterly you know the term “planing,” which Jan Heine uses to describe bikes that take pedaling energy and release it in a way that makes the bike easier to propel. This bike definitely planes for me. I never felt the weight penalty of the bottles and 10 pounds of gear or more — more depending on how many jambon sandwiches were stuffed in the Carradice and apples in the front bag! I’ll point out up front that I pursued a very traditional build in my desire to ensure comfort and reliability. 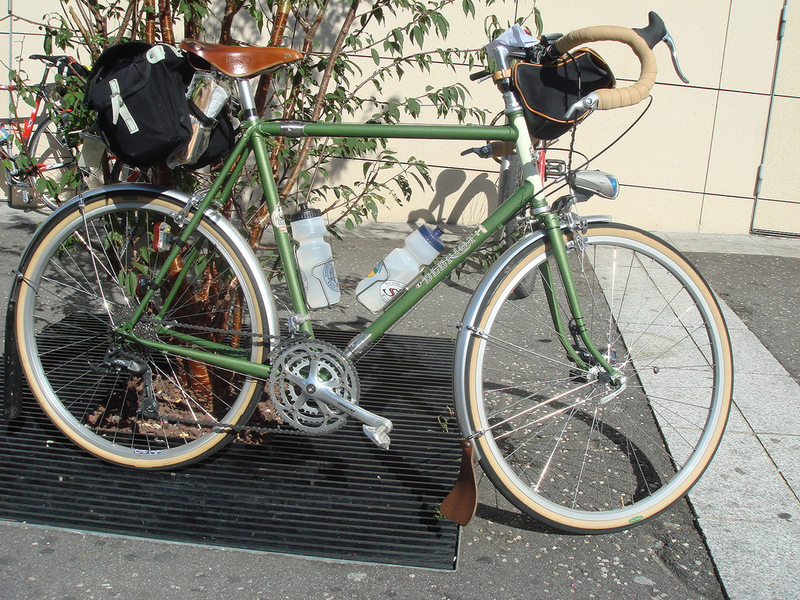 That meant using 8-speed bar end shifters, 36-spoke wheels and a Brooks saddle. The modern touches include single-sided Ultegra SPD pedals (I refuse to move on, even though they were discontinued years ago) and plastic SKS fenders instead of metal, mostly for ease of packing. I chose the new color when I had the couplers installed at Bilenky Cycle Works in Philadelphia. Rivendell supplied new decals directly to Bilenky. The only change I’m making is the seat post, which has serrated indents, for a Nitto where I can fine-tune the tilt more precisely. By the end of PBP it felt like the nose was coming up, which I suspect was caused by the leather relaxing under my sit bones. The brakes were somewhat spongy in the rain but performed well when I remembered to scrub water from the rims first.